This is simply not true. Snow plows are designed with blade stops for stacking to protect the equipment and make the plow perform properly. A direct hydraulic lift system will stack just as high as another type of lift system. Stacking height is also related to how heavy the snow is, the vehicle you are using, the outdoor temperature, and the size of the plow you are using. With ideal conditions in place, a direct hydraulic lift system can stack snow higher than the roof of the truck! Myth #2: A direct lift system bounces over bumps. If the blade is all the way up in the raised position the plow will not bounce. However, if the blade is raised partially, the blade will bounce a bit, because there is now air in the top of the lift cylinder that can compress over a bump. Chain lift systems will also bounce if they are not fully raised. To eliminate bounce while transporting the plow, it is recommended that the plow remain in the fully raised position to eliminate the capturing of air in the lift system. Myth #3: If the hydraulics fail you will be stranded. Not True. 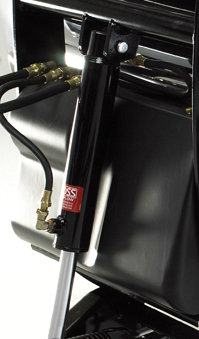 Just like a Chain Lift System, the Direct Lift Cylinder system offers the capability of being “strapped” in the up position should a failure occur. One of the most important pieces of emergency equipment you can bring with you on the job is a 2” ratchet strap. In the event there is a hydraulic failure, remove the upper pin on the lift cylinder and use the strap to lift the plow off the ground for transport. Even if you have a chain style lift you should have a ratchet strap handy, because if your chain fails, you will have no way to lift the plow. Also, if there isn’t enough snow to ride the plow up to short chain your chain lift system you will need a ratchet strap to transport the plow. Myth #4: A plow with a Direct Lift Cylinder System can’t “float”. This is absolutely not true. A direct lift cylinder plow system can be put into float, allowing the cutting edge to follow the contours of the plowing surface. A benefit of the Direct Lift system: when you raise the plow out of the float mode, the response time is very quick as there is no chain involved. Along with the myths, there are also benefits of a direct hydraulic lift system. The direct lift system has less moving parts than a chain lift system, offers a cleaner design and allows for hydraulic attachment options like THE BOSS SmartHitch2 system. Now that we’ve cleared the myths surrounding a hydraulic lift system, snow plow owners can be confident that it offers a cleaner, more refined look on the front of the truck, with fewer moving parts. More importantly it’s a reliable, durable system that keeps them on the job, day after day and night after night.